If REALLY pressed to name a favourite vegetable, I think I’d choose broccoli. It is a really versatile vegetable, at home in a variety of cuisines from Italian to Asian. This recipe is sort of Calabrian. It is based on a recipe that was told to me by my Italian hairdresser more than ten years ago. It was her mother’s recipe. The original has the broccoli cooked in with the pasta water for the last couple of minutes, and when I am in a real hurry I do it this way, which is also delicious. 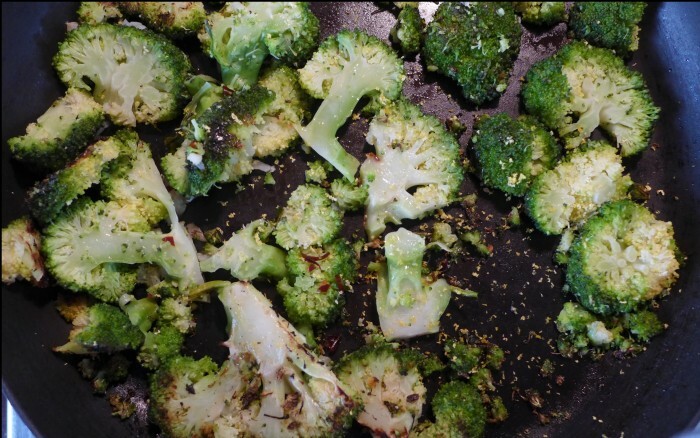 But the step of charring the broccoli in a pan gives it the dish an extra dimension of caramelised smokiness that I like. I haven’t given any amounts in the recipe below, this is a recipe that can use as much or as little as you like of any of the few ingredients. While the spaghetti is cooking heat some olive oil in a pan until it is really hot. Add the broccoli and allow it to char. Don't stir it, you want it charred on one side. Once the charring is to your liking, add garlic and chilli and let them cook briefly, taking care not to burn the garlic. Add a very small amount of water to the pan and cover. Let it steam until bright green and tender. There should be no water left in the pan. 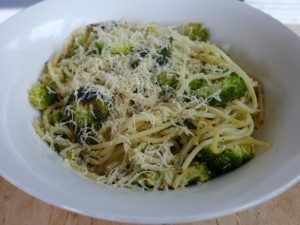 Toss the cooked spaghetti into the pan with the broccoli and squeeze some lemon into the pan. If it is too dry, add a bit of the pasta cooking water. Serve as is, or add some grated vegan parmesan cheese. I like the piquant Vegusto 'cheese' for this. This looks good – lovely classic flavours, and the charred broccoli definitely gives it an extra something. This is a great flavour combination! I Carusi has a (non-vegan) pizza with the broccoli-chilli-lemon topping and it’s my favourite. I should try it with pasta. Oh how I miss that broccoli pizza, I used to get in my pre vegan days from Pizza Meine Liebe and For the love of Pizza. I wonder if they’d make me one if I took in some Notzarella? It was delicious! I added rainbow chard before I put the lid on, just because my little cast iron frying pan couldn’t hold any more broccoli. And I tried that Vegusto cheese for the first time, and it was really good! Thanks for the suggestion.